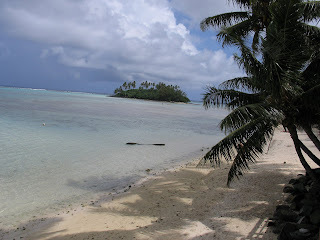 Rarotonga continues to be a beautiful and meaningful service location for Global Volunteers! Team (Vaka) 102 made a significant impact on the island in addressing Millennium Development Goal #3: Ensure that, by 2015, children everywhere, boys and girls alike, will be able to complete a full course of primary schooling. This team of 10 volunteers provided more than 1, 500 hours of reading and English instruction to 115 Cook Islands students. We’re grateful to our school hosts for the invitations to serve their children in this way. *****Since our first meeting (the meet and greet dinner) everyone has been very patient, honest, supportive, and optimistic to me and the other members of our team. Today my mom, sister, and I read to the second and fourth graders at St Joseph Elementary School. Sister Cecilia is very wonderful. She is a little bundle of spice and everything nice. She invited us to morning tea at 10:30. Lexi, mom, and I ended up having a huge snack consisting of noodles, tuna, bread, butter and tea. Then till about one o’clock we read with the children. Every child receives a certificate of achievement. Then the children have recess. They invited Lexi and I to play Duck Duck Goose with them. I was in luck. Duck Duck Goose is my favorite game. I was picked to be the goose many times. The little ones told me that I was funny and very fast. For me being fast is very ironic. I ended up in the mush pot 3 times. I kind of jogged so they could catch me. Other times they got me before I could run across the circle. I also acted a lot. I pretend to sniff and sneeze and I danced all around them. I wish that I did not have to leave them but I am seeing them Thursday and Friday. They cannot wait to see Lexi and I again. Tomorrow we are visiting the “Mamas. ” I’m very excited because I frequently visit my 93-year-old grandmother. I can’t wait to hear their stories and to be able to give my services to them. This has been and still is a fantastic experience. I am sooo fortunate! Thank you to my family, team Vaka 102 and to the Global Volunteer organization. *****The truth of our impact was shown to us as we walked through the town center. Kids were waving and smiling at my daughters, with their parents extending a quiet wave and soft smile. Sharing a meal with the Mamas and having them chat & chat with us, and hug us when we left showed us how we have impacted others. For it is in the individuals that we have touched and that have touched us – that is the reason we are here. In the weeks and months ahead as we reflect on the experience we had enjoyed here I believe we will realize that we have been changed because of being a Global Volunteer on the Cook Islands. We have broadened our perspective of the world. Hopefully we will retain some of the Island gentleness and philosophy of slow down and enjoy now. To enjoy the present with the relationships of those around us rather than always rushing to a future situation is a mantra of these last 7 days. I would be remiss not to mention the impact of each member of the team on my family. Vaka 102 is a diverse global community in itself reflecting different cultures and paths of life. Yet each is driven with a passion to make the world a better place. Each has chosen action, not just talk, and has invested much of themselves in the project. We are grateful to the new friendships we have made. A special thank you to Debi Futter-Puati, our team leader. Her perception of each of us as individuals and her non-judgmental philosophy has made us comfortable and enhanced our experience. We are grateful to be a part of Vaka 102. *******On Friday, I went to work at Takitumu Primary School around 8:30 am and gradually read with our other 5-6 students for 20 minutes each throughout the day. When we first started reading with the kids, I didn’t really enjoy it or the thought of doing the same thing everyday for 2 weeks. But now the first week is over and I’m having a very good time with the kids! They aren’t so shy around Kay, Camela and I; they act like themselves. My favourite part of the day would have to be when we first arrive and walk to our room. We pass all the classrooms and the kids, including the ones we don’t read with, know our names, tell us “Good Morning” and are excited we are there; it’s great!! I only have a week left here with Global Volunteers, but I had and am still having a fantastic time! I don’t think I will ever forget about this once in a lifetime experience in the Cook Islands with my Grandma and Vaka 102. Thank you all! It was low tide at the Kiikii today. As I walked out to the reef, the sun danced on the inky blue sea urchins. The sight was spectacular, but ephemeral. Soon, the tide started to lap back in, announcing that tidal visitation hours were over. This was a reminder that all experiences are transitory. Engaging in global volunteering acknowledges such interdependence. As we embrace the diversity of culture, valuing the different patterns and customs in the world, we are anchored by the enduring truths of humanity present in all cultures. By nature we are relational creatures; we need one another. In making a child feel smart and successful, we understand the joys of true success. The tide will be coming in on our trip faster than we can anticipate, but we will have seen, shared and served – each in our own way. As my mom said in today’s thought for the day, sometimes the lesson comes after the learning. The lessons for Vaka 102 may continue on for many years as the coral slowly turns into sand and the individual patterns become one.